Konami today announced that it has closed individual license deals with 21 Brazilian club teams for PES 2015. Pro Evolution Soccer 2015 will include all 20 Brazilian Série A teams as well as Série B team Vasco da Gama. Only four of the individual club licenses for PES 2015 include the right to use real names for the respective players which means that the other 17 teams will initially appear with fake names. Real player names will at first only be available for Corinthians, Cruzeiro, Figueirense and Palmeiras. Konami is currently working on including the player name rights in the various contracts and will unlock player names for the missing teams in time for the game release in November or as part of the digital data-pack updates after launch. The Brazilian league was first included in Pro Evolution Soccer with PES 2013 and always featured all correct player names. This summer, though, it was ruled that the previously closed contracts where not rightfully including the individual player licenses which also led to EA excluding the Brazilian league in FIFA 15. 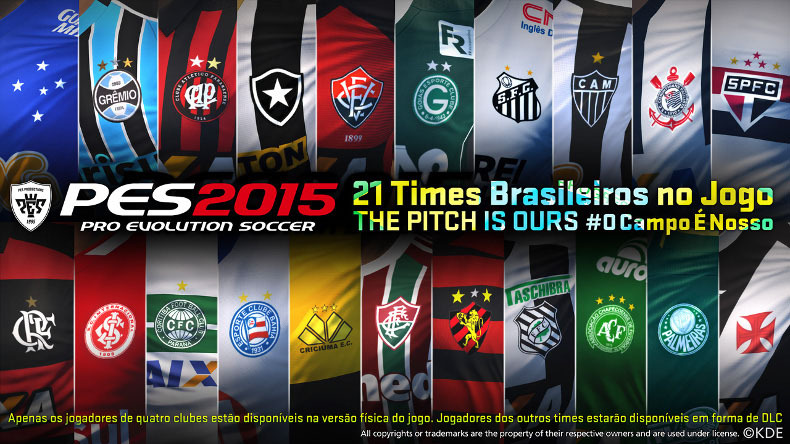 Here's a list of all Brazilian clubs licensed in Pro Evolution Soccer 2015.